Pity the left-wing Guardian which also happens to be strongly Europhile. Hence it tries to construct a fantasy in which all right wingers are rabid Eurosceptics while all the left-wingers support the project. Nevertheless, you can see the paper struggling with today's story about Gordon Brown's "right hand man", the treasury minister Ed Balls. He is to announce that the government is to publish a yearly statement on all European Union spending in the UK as "a first step towards cracking down on waste and fraud." We are also told that he will describe the state of the EU budget as "a disappointment and an embarrassment", following its rejection by auditors for the 12th year running. Such mildly communautaire action by the treasury minister is then hailed by the paper as evidence of the chancellor and his supporters being "keen to outflank the Tories on Europe", suggesting they will weaken Britain's international influence by isolation, and destroy its ability to lead reform. It then goes on to remind us that "David Cameron alienated potential allies in Europe by pledging to take Conservatives out of the main centre right grouping of MEPs, albeit in three years time." However, we are told, the EU-loving Mr Balls said this month that it was in Britain's national interest to collaborate more closely with the EU and that Brussels should have more powers to deal with issues such as climate change. So there you have it. The world view prevails and the Guardian is at peace with itself. 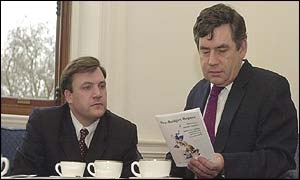 It can then allow, through the eyes of el presidente José Manuel Barroso, that Gordon Brown is "sceptical" - though not hostile - about the value of the EU and its work, while the dangerous right winger Cameron is "sceptical" and out to destroy the Union. One could only wish that the paper had got it right and the Boy really was as painted. As it stands, though, he is probably vastly more in favour of the project than Gordon, which is giving rise to some rather muddled thinking.